Saudi Crown Prince Mohamed Bin Salman, popularly known by his initials as MBS, is either one of the world’s most admired leaders or its most reviled depending on who one asks. His friends characterize him as a noble reformer while his foes denounce him as a bloody tyrant. In reality, however, MBS is actually both, and that’s why the leaders of the US, China, and even Russia are competing to court him for their own reasons. To get the dirt out of the way first, MBS was single-handedly responsible for ordering the ongoing Saudi-led War on Yemen that’s contributed to one of the world’s worst humanitarian crises, and he’s so ruthless that he even imprisoned members of his own family last year in a de-facto “deep state” coup when his allied military-intelligence services detained them on supposed “anti-corruption” charges. Moreover, it’s recently come to light that he might have even ordered the gruesome assassination of a dissident in the Saudi consulate in Istanbul. Saudi Crown Prince Mohammed bin Salman arrives for a meeting with British Prime Minister Theresa May in number 10 Downing Street on March 7, 2018 in London, England. At the same time, however, there’s no denying the gradual progress that MBS has made in reforming the Wahhabi and oil-dependent socio-economic situation in the Kingdom through his ambitious legacy-defining Vision 2030. Although unstated for “politically correct” reasons, and whether for good or for bad, he seems intent on getting women out of their households and into the workforce as the country’s majority-youthful and comparatively “liberal” population attempts to transition to a post-oil future. In terms of external politics, MBS pioneered his country’s fast-moving rapprochement with Russia which has seen Saudi Arabia consider purchasing S-400 anti-air defense systems after committing to a portfolio of other arms during King Salman’s historic visit to Moscow in October 2017. This led to the two Great Powers dominating the global oil industry through their OPEC+ partnership and cooperating in reaching a pragmatic solution to the War on Syria given their premier sponsorship of the opposing parties. China can’t get enough of MBS after his country agreed to receive over $130 billion worth of Silk Road investments from the People’s Republic in two separate deals last year, predicated as they are on both Beijing’s pressing energy interests but also its desire to link the Belt & Road Initiative (BRI) with Vision 2030. China considers Saudi Arabia to be a tri-continental pivot state at the crossroads of Afro-Eurasia, therefore making it an indispensable geostrategic partner, to say nothing of an economic one when it comes to the “petroyuan”. 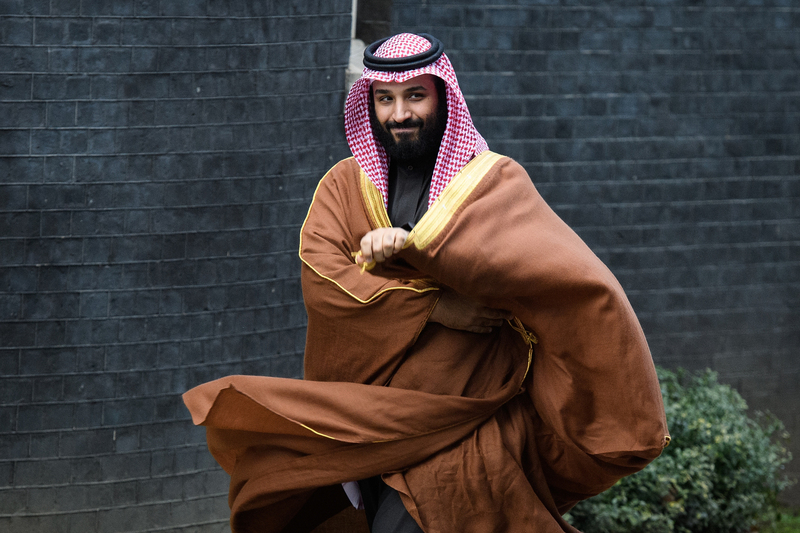 As for America, it loves MBS’ insatiable hunger for arms and is eager to do all that it takes to get his country to go forward with the high-profile $110 billion arms deal that was signed last year. It also requires his stamp of approval on any forthcoming “deal of the century” for Palestine in order to at least “officially” deflect the expected opposition that this presumable sell-out arrangement will provoke among the international Muslim community (“Ummah”). In addition, there are obvious energy interests between the two, too. It’s “politically incorrect” for anyone to openly say, but none of these three countries sincerely cares about the domestic situation in Saudi Arabia or the country’s alleged assassination of dissidents abroad, but the US at least sometimes speaks out on these issues from time to time in order to put more pressure on its counterpart in a bid to get a better deal on whatever it is that they’re negotiating for at the time. The same can be said of Russia if it chooses to ever comment on these topics. MBS is so attractive to each of them precisely because he’s both a noble reformer and a bloody tyrant. The first-mentioned part is responsible for his country’s unprecedented but nevertheless imperfect geopolitical balancing act and structural complementarity with the New Silk Road, while the second is ultra-profitable for the Russian, American, and even Chinese military-industrial complexes. All of these Great Powers also like that he cooperates with them in the energy sphere too, albeit in different ways and towards different ends. The confluence of interests that the US, Russia, and China share when it comes to MBS makes him “too important” for any of them to “discredit” and risk jeopardizing their win-win partnerships with his country. The US, and perhaps maybe even Russia, might occasionally “virtue signal” opposition to some Saudi actions, though it’s “normatively disingenuous” because such statements are only made for negotiating leverage. All three countries see the character behind the caricatures that realize that MBS’ mix of noble reformer and bloody tyrant is just the way he is.